Once, I met a man named Greg. Greg was homeless. He was one whom society overlooked or avoided. Still, Greg was a member of our community, a person created by God, a sinner in need of redemption. Who would have thought that such a man would soon become my best friend? People like Greg are not new to society; the world has been busy ignoring them for thousands of years. When we read the gospels we meet Greg many times over. We meet Greg the leper, Greg the blind beggar, Greg the lost and forgotten. The world shuns such people, yet Jesus meets Greg and invites him to follow. 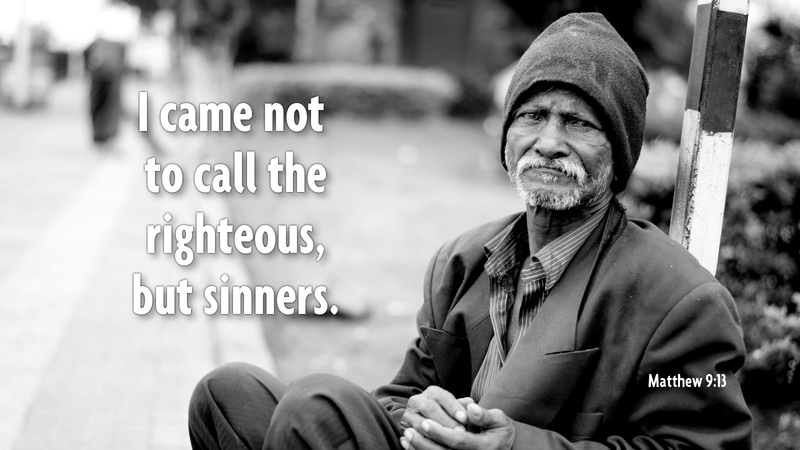 Jesus came to heal the sick and forgive the sins of many. His mission often led him to associate with the dregs of society. The Pharisees were always quick to point out Jesus’ “misdeeds.” Heal on the Sabbath? Associate with prostitutes and sinners? Dine with a tax collector? The Pharisees weren’t willing to do such things, the stakes were too high. They had reputations to protect and laws to follow. Jesus overcomes all this. He loves those whom society deems unlovable, opens his arms, and invites the sinner to follow. Thanks be to God. Prayer: Lord Jesus Christ, whose love is immeasurable and grace sufficient, keep us close forever. Amen.